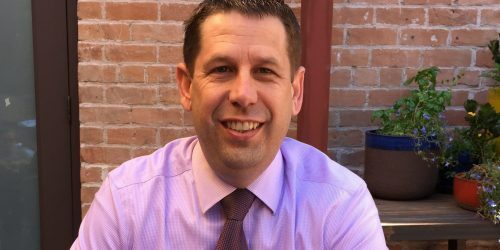 I recently met with the CIO of Maricopa County, David L. Stevens, to hear some of his thoughts around our local government and technology. We talked about a lot, like how he handles being the central enterprise IT provider for over 50 county departments to his take on big data and his favorite pieces of advice. I grew up in Arizona in the West Valley as a first generation Arizonan – I can remember when Bell Road was a two lane road and 67th Avenue was considered remote, as well as the days before the Loop 101. Growing up, there were vast orange groves that could be seen from on top of Thunderbird Mountain. I’ve always been interested in (and involved with) electronics. But, I originally was fascinated by medicine and contemplated a career in neurosurgery. My gift when I turned sixteen was a Gray’s Anatomy book that I studied for fun. Technology is something I stumbled on later when serving in the Army. As a military policeman, I worked a lot around military intelligence. Through my work, I was able to see all the things technology could do. It was then that I decided a career in technology would be the way to go. What are one or two of the more exciting technology projects happening at the county? We have a ton. We are in year two of a three-year OET Strategic Plan that I put forward. I’ve been really excited about a number of the investments we’re making. Collocated datacenter, service portfolio and direct charge financial models, a complete overhaul of the county network infrastructure and VoIP telephony, a new ERP project, and most significantly focusing on our greatest asset – people. Also, the elected officials have several significant projects, for instance the County Treasurer is thinking through a new system, the Assessor’s office is underway on a new CAMA system, and the Sheriff’s Office is evaluating options for a new jail management system. Every single county organization has something substantive going on right now. Our plan has been all about the fundamentals of good service and creating the building blocks that will drive future efficiencies and services. Your office serves as the central enterprise IT provider for over 50 county departments. What lessons have you learned trying to serve so many customers? I’ve learned that understanding the business challenges and vision of local departments are essential to providing exceptional customer service. This means listening and communicating effectively how we can be partners in delivering value-added services. It is critical to build trust and always put yourself in the perspective of the customers, as a partner who is vested in their success. And, sometimes you have to be able to share when plans do not make sense or where a partnership is not in either group’s best interest. I am really impressed with your FY14 Business Value Report. You don’t find this transparency very often. Tell me a little about the decision to write this report and some highlights. This was something that I felt was essential to tell the story of technology as it relates to our three-year strategic plan. I wanted to ensure we are communicating our success in both business and customer terms. This report, along with our strategic plan and quarterly report, are the foundation of keeping us focused on our investments and our customers. Many companies use this method to communicate the value-add technology brings to the business – we wanted to model this in state and local government. This won’t answer all of our business partners’ questions, but when they show up they can say, “here is where I can really add value.” Next year’s report will be even better. We are trying to evolve this into more financial business metrics, so you can look and see what is good and what isn’t. Our next report will come out in the end of July or beginning of August. Mobility and cyber security are two hot topics in technology. What is the county’s strategy to deal with them? Two years ago we instituted a mobile BYOD program and deployed an MDM solution to build on. Mobility and engagement are a central theme that will be part of the next three-year strategic plan that I’m developing now. Cyber security specifically is something I focus on a lot, and we’ve made targeted investments to ensure we are building a program that is capable, as well as measured and augmented by outside expertise. I tell people that CIOs need to become a little more like CISOs and the reverse is true too – you need CISOs to think more like CIOs. We have blended this really well. I don’t spend too much time in the technical details, but instead focus on the messaging, policy, assessing the investment and risk offsets, as well as the impact to those we support. Also along these lines, I spend time focusing on the Incident Response plans and developing executive metrics of cyber security. And, I chair the technology committee at MAG and made my chair initiative cyber security, so we brought in resources to educate and share with the cities. What do you see as the county’s biggest technology challenges over the next year and the next five years? People are the most significant challenge faced by state and local government. Securing and competing for top talent to meet the complex needs of large enterprise systems can be difficult. Dealing with the growing digital business disruption that companies are facing and citizens are coming to expect from their government also will pose significant challenges. The need to control costs while investing in technology solutions that improve our ability to deliver speed to market. Over the next five years, specific to technology, our key challenges include integrating mobile, data analytics, cyber security as a future state while competently overhauling end of life business systems. We are on track for success. I think it is important IT is the business, not separate from it. What I mean is that the most successful companies understand that IT is a significant part of growth and success – the CIO is at the table as a partner helping to share the company’s strategies. So, the challenge for government is learning how to build this kind of relationship and leverage it as a competitive edge. The challenge is policy. The challenge is understanding. The challenge is not the technology – it rarely is. For me, this is an opportunity that is largely untapped. If you were able to look at criminal justice, public health, human services, and administrative data collectively, you could answer systemic questions very powerfully. To get there, there is a lot of trust, understanding and confidence that has to be built about the use of the data. We have a good handle on the criminal justice side, but I hope to see in time including the other areas so we can see a complete picture. The components are there. I tend to talk a lot about the significance of great people and treating them well – that we all are standing on the shoulders of giants. I also often talk about the necessity to focus on the fundamentals and get them right so we can then concentrate on the opportunity to bring new value. There is always the temptation of the “shiny object.” But, if you don’t get the fundamentals in order nothing will last, be cost effective, or be successful. You might hear me say, “At the end of the day….” a lot too. I have a 120 pound American Bulldog, named Naia, that is spoiled. I also enjoy hiking, running, landscape photography, and spending time with my family on various trips. Photography is a great excuse to get out and see the beauty of Arizona and other places across our nation. I don’t have any pictures up in my office though – I have them at home. Pubic service is not for the faint of heart. You must be able to collaborate, build trust, and work in a federated environment – you must be tenacious and committed to overcoming challenges. At the same time, public service is a rewarding experience and provides ample opportunities to make a significant difference in your community. The solutions that are developed will often be in place for many years and have a direct impact on the citizens we serve – this is a serious responsibility and one that most public servants take seriously.